Best Deal! 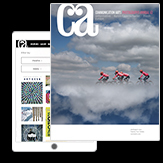 Print and PDF editions of the Design, Advertising, Illustration, Photography, Interactive and Typography Annuals + unlimited access to the Commarts website. PDF editions of the Design, Advertising, Illustration, Photography, Interactive and Typography Annuals + unlimited access to the Commarts website.